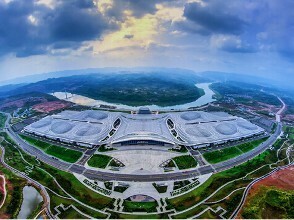 The largest and most influential retail industry event in the Asia Pacific region and the top three retailers conventions in the world will be held in Chongqing International Expo Center on September 5th 2019, 14 years after Beijing held this event last time in China. Chongqing becomes the second city in China to host this event after Beijing. will be attended by over 4500 professionals including major global companies. In Kuala Lumpur Convention Center in Malaysia on October 31st 2017, the flag of 19th Asia Pacific Rim Asia Pacific Retailers' Convention & Exhibition (APRCE 2019 Chongqing) was handed over to Chongqing at the 18th Asia Pacific Retailers Convention. According to the introduction, the Asia Pacific retailers conference is one of the core activities of the Asia Pacific Retailers Association Alliance and held every two years. This convention is critical to study the development trend of the retail industry, research on communication management experience, solve new problems facing the provision of cross-border and cross regional cooperation opportunities, and enhance the host country and city's status of the retail industry. The first Asia Pacific Retailers Convention was held in Tokyo Japan in 1983, the twelfth in Beijing in 2005, and the eighteenth in October 25th 2018 in Kuala Lumpur. On October 27 2016, the leaders of the Asia Pacific Retailers Association met in Kuala Lumpur Convention Center. One of the most important contents of the meeting was to vote for the location of the 19th Asia Pacific Retailers Convention. To prepare for the vote, in September 2016, the vice president of the China Federation of Commerce, Zhang Lijun and other experts were invited to conduct a survey on the hardware environment and software environment of the exhibition activities in Chongqing. With the support and coordination of China Business Association, after three rounds of intense votes, Chongqing won the location for the 19th Asia Pacific Retailers Convention. Chongqing has been leading the sustainable development in China for several years. The total GDP has been from top ten to top five this year after Shanghai , Beijing , Guangzhou and Shenzhen . The service industry and consumer retail industry have been contributing to the GDP growth, mostly from domestic consumption. Chongqing has attracted the most Chinese tourists in recent years, and is the world number one tourism growth for next ten years, according to recent World Travel and Tourism Council report.